Ellingen belonged to the Teutonic Order from 1216 onwards and was the Residence of the Territorial Commander of the Bailiwick of Franconia. This was the most powerful bailiwick in the Teutonic Order, and the small town of Ellingen thus represented the centre of a far-reaching territorial and economic power. At the time when today’s palace was built, however, the Teutonic Order had already become a charitable institution for the lower aristocracy. The site of today’s palace was previously occupied by various medieval buildings, as well as a highly prestigious Renaissance building. Starting in 1708, the present palace grounds were built and the late Gothic church was converted to the Baroque style. 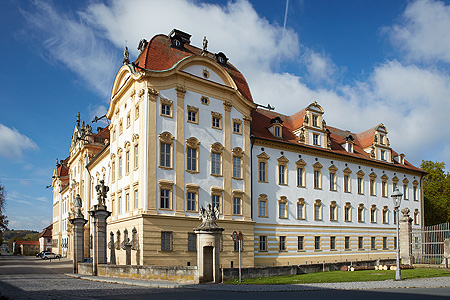 The vast main building was built by the architect Franz Keller from 1718 to 1720. Of the interior decorations, the ceiling frescos, wall panelling, floors and above all the stucco work by Franz Joseph Roth have survived. The colonnade in the inner courtyard is part of the conversion work carried out by French architect Michel d’Ixnard and was newly erected around 1775. In 1789, the seat of the Bailiwick of Franconia was moved to Bad Mergenheim. This effectively closed the history of Ellingen Palace as the Residence of the Teutonic Order. A few years later, the Order was almost completely dissolved and ownership of Ellingen passed to the Kingdom of Bavaria. 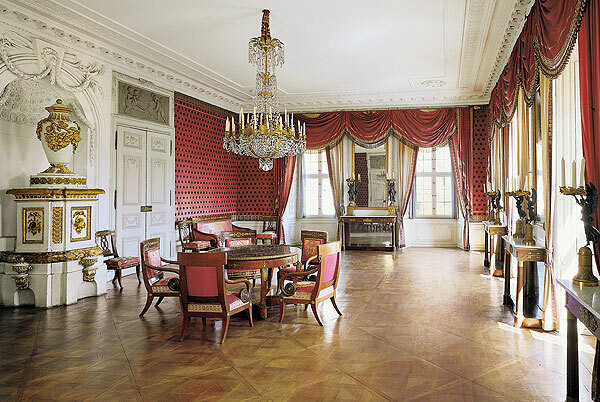 In 1815, King Max I Joseph presented the palace to his outstanding field-marshal, Carl Philipp, Prince of Wrede, who had several rows of rooms newly decorated with enormously expensive silk and paper wallpapers, furniture, glass and bronzes from Paris. Together with the stucco work and furniture by Michel d’Ixnard, these rooms are now among the most important interior design works dating from the Classicist period in Bavaria. Around the end of March there is a carpet of alpine squills (Latin: Scilla) under the massive old trees in the palace park. The palace church is suitable for concerts, religious services, weddings and christenings up to 250 persons. The palace courtyard is suitable for concerts, receptions and markets up to 1.000 persons.